Completing your CDL training is only the first step in starting your new career in trucking. Once you finish your training, you’re ready to start searching for trucking jobs! The good news is that there is a high demand for truck drivers. In fact, there are currently about 60,000+ job openings in the trucking industry. 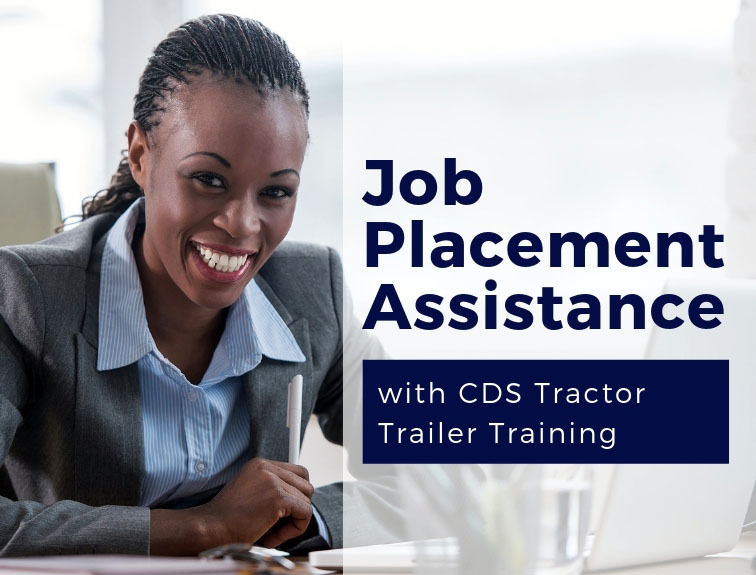 Discover how CDS Tractor Trailer Training can help you get hired in trucking! Offering top-notch CDL training is not our only goal at CDS Tractor Trailer Training. We’re also here to help you get hired after earning your Commercial Driver’s License! With the job placement services at every CDS Training Center, graduates will receive help filling out applications, updating their resume, building their network and much more! As a good standing CDS student, our team is here to help you find a truck job that you’ll love. CDS maintains relationships with over 20 top trucking companies in the United States. Training Centers are regularly hosting hiring events with recruiters from these trucking carriers! Recruiters are visiting the CDS centers weekly looking to hire new truck drivers and to share what their company has to offer. This gives students opportunities to directly network with trucking companies and find what works best for them. These events are also open to the public in addition to CDS students and graduates. There are various CDL job openings out there and a lot of trucking companies who are interested in hiring CDS graduates specifically. We invite you to join us for these recruiter events and get your questions answered! 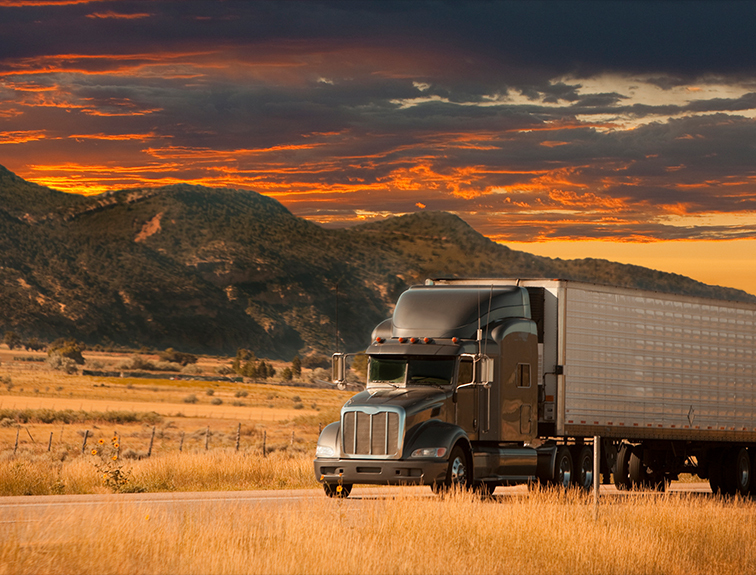 These are just a few of the benefits that come along with working in the trucking industry. You can make a livable wage and have a career full of options to advance by finishing your CDL training. CDS Tractor Trailer Training has the training you need to exceed as a professional truck driver! If you have recently completed your CDL training, congratulations! You’re fresh out of training and ready to start life as a truck driver, so what happens next? Here’s a rundown on what you can expect after completing your CDL training. When you sign on to a carrier, you should know what they can offer you in benefits. Some carriers offer tuition assistance upon hire and can help you receive CDL training reimbursement. To receive the reimbursement, you will likely be required to work for the company a set period of time. 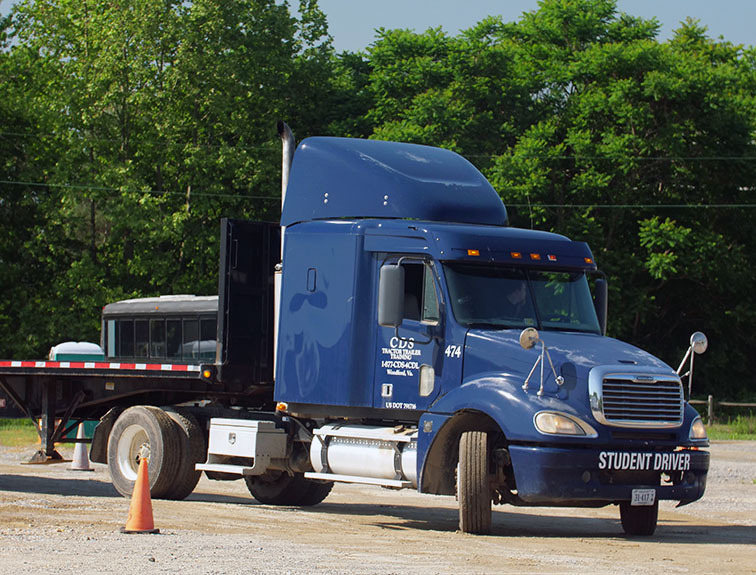 Some CDL training programs even offer a pre-hire program for students, making it easier to get started trucking after training. Signing with a carrier providing these benefits will jump-start your new career on the road, as well as give you the necessary learning experiences right out of training. Within your carrier, you can expect company training to start getting that valuable seat time. This may include a mentor, a driver instructor in the truck with you, or other external training. All this is going to be your ticket to hitting the road as quickly as possible, with the tools and safety to succeed at every job going forward in your trucking career. Seat time, seat time, seat time! Any training on the road will give you the most valuable exposure to your new life as a trucker. Doing so will help relax you more each time so you can fully enjoy your time driving. These are the basics of what you can expect after CDL training. CDS Tractor Training wishes you the best of luck and safe travels on your new truck driving journey! Please feel free to contact us at the CDS Tractor Trailer Training for further assistance. 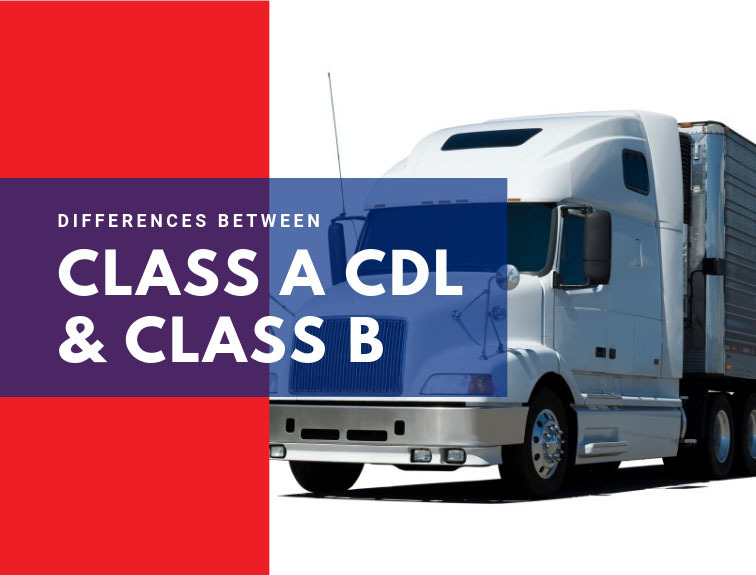 If you’re thinking about getting a Commercial Driver’s License (CDL), it’s important to know the difference between a Class A Commercial Driver’s License and a Class B CDL. Essentially, the weight of the vehicle(s) determines whether you can or cannot drive with your new license. Below you’ll find information that explains the difference in general terms, which will help you choose the CDL that’s right for you. These are all vehicles or combinations of vehicles with a Gross Vehicle Weight Rating (GVWR) of 26,001 pounds or more. The Class A CDL also lets you tow vehicles that weigh 10,000 pounds or more. What License Works for You? Although a Class B CDL is a good choice for those looking to drive for shorter periods of time, the salaries are much less attractive and the job prospects are more limited. A Class A CDL is definitely the option with more career possibilities and higher average salaries. Those with a Class A CDL can operate a greater diversity of vehicles, and jobs for Class A holders are in high demand. The outlook for the trucking industry for 2019, will continue to be an increase in demand for the transportation of goods and plenty of Class A trucking job vacancies. At CDS, the staff even assists you with the job placement process after training, further solidifying your career path. For more information about getting your Class A CDL, contact us today! 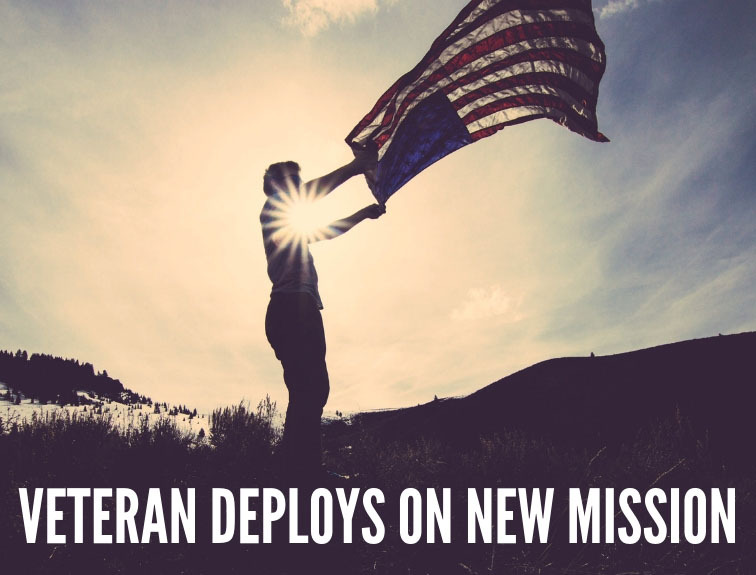 Lawmakers have currently expressed their interest in giving the VA’s Workforce Credential Program a much needed financial kick start. As this legislative period comes to a close, the VA’s Workforce Credential Program is one of the main topics that lawmakers have left to discuss. This “FastForward” initiative is intended to help continue to boost the economy by providing additional funds for Virginia residents. The VA Workforce Credential Program is a short-term initiative that lasts about 6 to 12 weeks and allows Virginia residents to register for classes within the Virginia Community College System. These programs get geared towards industries such as trucking and manufacturing. Getting students “in-and-out” allows people to have a chance at getting a quality education so that they can get jobs in in-demand fields and better their individual lives. By training students in specific fields where the demand is high, helps ensure that these students will find jobs when they graduate from the program. FastForward programs require students to pay 1/3 of the cost up front, and the institution takes care of the rest. The FastForward programs not only boost industries like the trucking industry, but it also helps Virginia families who have adults out working minimum wage jobs trying to support families break what a cycle of being meager income or even in poverty is. It gives people of all ages and from all walks of life a chance to improve their lives, make a better living, gain the benefits that come with truck driving jobs (and those in many other industries), and provide for their families long-term. The state of Virginia is willing to pay up to $3,000 per student for credentials with the most expensive program costing about $4,500 ($1,500 out of pocket for the participant). So far, since 2016 over 12,000 participants have received credentials and been able to improve their lives thanks to the VA Workforce Credential Program. It has been announced that there have been an additional $4 million allocated to the program, which is believed to cover the entire backlog of money that the program needed to get up to date on their past expenses. The Community College Workforce Alliance reports that a large portion of the students who came through the program indeed ended up going to training to get their CDL and work in the trucking industry. Del. Chris Jones (R-District 76) reports that the goal of the program is to train truck drivers as well as many other skilled laborers such as those who get needed in the manufacturing industry. The purpose of this entire bill is to give more people the opportunity to gain skills that they will need to get into a higher-paying job with excellent benefits, so everyone has a chance to support their families. For further information about what this new initiative might mean for you, contact CDS Tractor Trailer Training. Let’s sit down and find a plan that makes sense financially and works with your current lifestyle! In the majority of states, you can get your driver’s license as early as sixteen, but if you are interested in being a truck driver, specifically driving out of state lines, you must be at least twenty-one. The DRIVE Safe Act is hoping to change all of that. The DRIVE Safe Act was passed by Congress and will allow those under twenty-one, but over eighteen, to cross state lines as an interstate truck driver with approval as long as they have their Commercial Driver’s License. There are other requirements involving a lengthy probationary period, a set amount of driving hours, and certain other criteria. During the probationary period, the hopeful driver will have to “… complete at least 400 hours of on-duty time and 240 hours of driving time with an experienced driver in the cab with them” by the end of the program in order to qualify. If the particular driver completes the criteria, they would be able to start immediately after obtaining their CDL. Why will the DRIVE Safe Act help trucking? For a long time now, there has been a shortage of truck drivers. This is not only negative for the trucking industry, but for the entire economy. “… that’s one of the reasons that consumer prices for goods have gone up recently, there are not enough drivers.” says the California Congressman, Duncan Hunter, who sponsored the act. The hope is that the DRIVE Safe Act will let more individuals right out of high school to dive right into interstate driving. As it is, most people who have just left school want to work immediately and while being an in-state driver is a possibility, it’s not a particularly good one. Youth that may have turned to trucking, instead end up in other career paths. With the DRIVE Safe Act, the goal is to help the truck driver shortage, while still making sure we have well-trained drivers on the road. When will the DRIVE Safe Act go into effect? 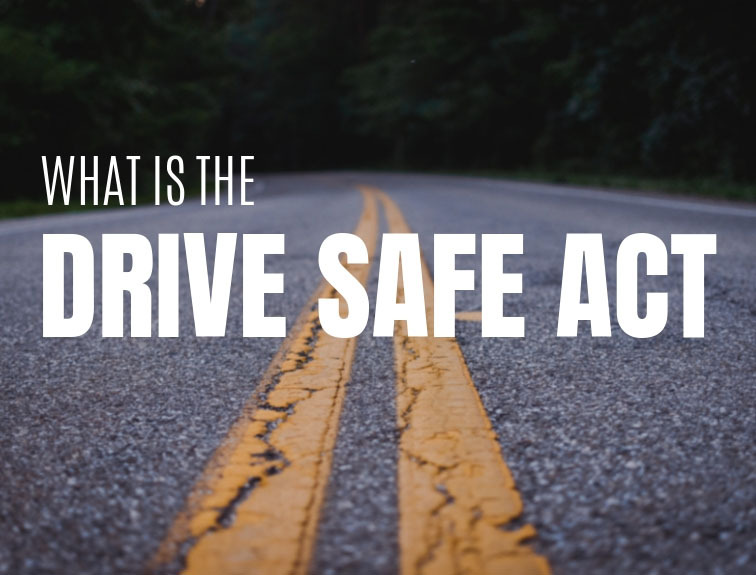 The DRIVE Safe Act was first sponsored by California Congressman Duncan Hunter in March 21st, of 2018. The Entry Level Driver Training Rule will likely go into effect around February of 2020. For more information on the DRIVE Safe Act as well as the CDL training at CDS Tractor Trailer Training, contact us today. We are ready to help you hit the road with a new career in trucking! Posted in Trucking NewsLeave a Comment on What is the DRIVE Safe Act? It has been 20-years since CDS Tractor Trailer Training opened their doors for the first time. 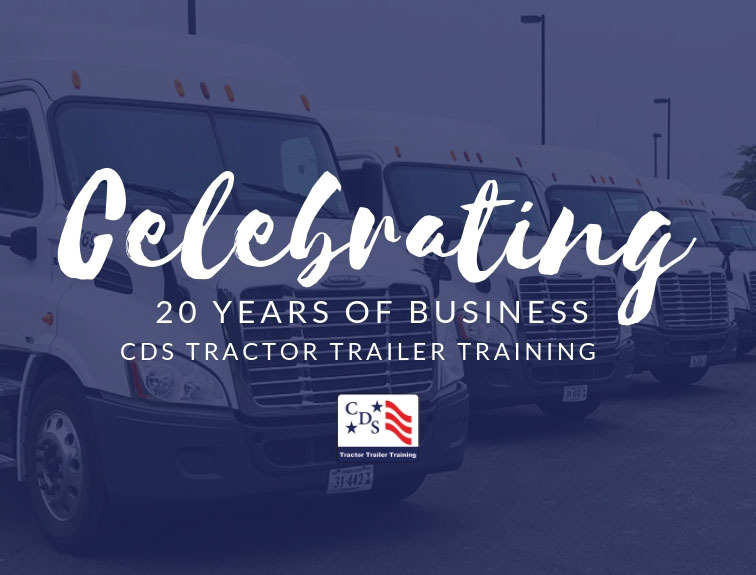 This week we celebrate the past, present, and future of our CDL training school and the success we have experienced these past two decades. Jill Balleh, founder and President, opened CDS Tractor Trailer Training in 1999 after previously working for other trucking schools. Her goal was simple, create a school with quality truck driver training. With quality training, everything else will follow. Jill’s goal has certainly worked and since opening their doors, CDS Tractor Trailer Training has graduated thousands of trucking students. Seven years ago, CDS partnered with several Virginia Community Colleges to help provide CDL training. Since then, CDS is now working with ten community colleges either providing training at the campus or through travel programs. CDS is proud to continue these partnerships with schools throughout Virginia along with providing training at their four campuses. The goal with every student is to provide professional training in a format that makes it possible to earn a Commercial Driver’s License and enter the workforce as a truck or bus driver. All of us at CDS Tractor Trailer Training are excited to continue growing our school and helping students earn their Commercial Driver’s License. With a nationwide shortage of truck drivers, there has never been a better time to begin a truck driving career! Let CDS help you earn your CDL license and begin a new job in the trucking industry. While some drivers spend more days than others on the road each year, the average days spent on the road is about 300. Some drivers will learn it takes about 2 years working in an OTR position before moving on to a regional or local truck driving jobs. This is often due to a companies desire for a drivers level of experience. Many OTR truck drivers will end up logging 70+ hours of driving over an average 8-day period. After that period, the law requires drivers to take a full 34-hour period of time off before resuming their driving. Drivers can consider cramming more hours into fewer days (i.e., 14-hour days over 8-days) but you will only be allowed to drive 11 hours per day which will be followed by a mandatory 10-hour rest period following every period of driving you complete. Some drivers prefer daylight driving while others prefer to drive at night. Either way, unless you are coming back from time off, then you have to report to your dispatcher at a particular time. Otherwise, you can drive which hours work best for you long as you follow the hours mentioned above. Set a schedule that helps you feel the most alert and stick with it. When working on an OTR schedule, you will get to go home once every 3 weeks or so. That kind of work schedule can be rough on relationships or lifelong partnerships. Having a serious talk with your partner to see if that lifestyle can work while you. Considered the time you will miss from home before you take a job that requires national driving. Some companies will pay drivers by the hour, while most will pay by the miles driven. Drivers can expect to make about $45,000 in your first year driving and usually $55,000 to $75,000 as an OTR driver every year after that. The average OTR driver will average about 125,000 miles per year or about 2,500 miles per week. Those miles add up to a lot of driving and a lot of time in solitude behind the wheel. Prospective drivers should decide if that appeals to them before taking on such a job. While you are on the road, you will essentially live out of your truck. Many trucks have a bed in the back where the driver sleeps, and many meals get eaten on the road. If this isn’t a lifestyle that sounds like something you would enjoy, then you might consider other careers than truck driving for a longer-term or job. OTR Driving turns out to be more of a lifestyle than just a job. OTR driving can change your life, and it can be something that many drivers come to enjoy and wish to do longer-term. Driving over-the-road will allow you so see many different parts of the continental US and the natural beauty it has to offer. However, deciding if it is for you is key before committing to a position. For further information on becoming an OTR driver and to see if it’s the right fit for you, to contact us today! CDS Tractor Trailer Training is ready to enroll you in your CDL training and get you one step closer to becoming an OTR driver. What is the DOT Physical Exam? The DOT Physical Exam is an examination that all truck drivers must take and pass to get their Commercial Driver’s License. The DOT Physical Exam determines if the driver is in satisfactory physical condition to drive without a risk. This exam is required as truck drivers are deemed “safety-sensitive” to other citizens out operating motor vehicles on the road each day. What’s the Purpose of the DOT Physical Exam? Drivers who have vision or hearing problems must bring either their glasses/contacts or hearing aids with them to the exam. Potential drivers with diabetes must bring their most recent and comprehensive Hemoglobin A1C (HbA1C) results and blood sugar logs with them. 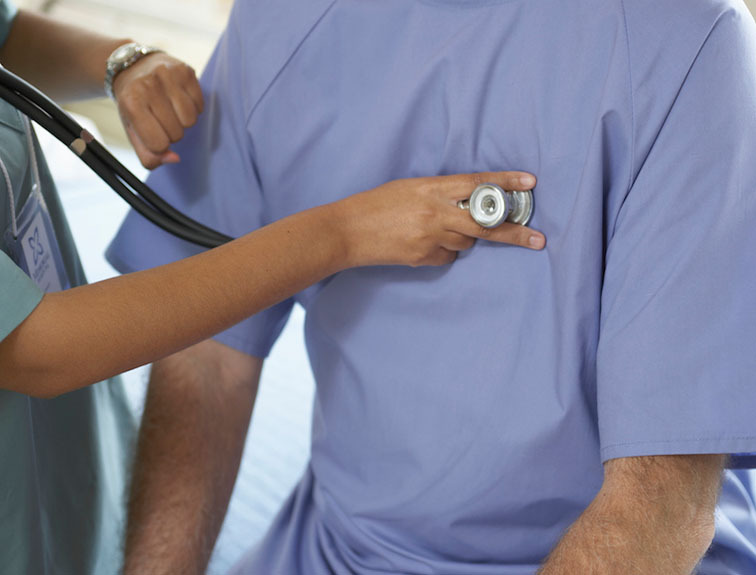 Drivers with heart-related issues must bring a letter from their cardiologist outlining the issues and limitations that the driver has as well as along with a note that they are safe to perform this kind of work. If a driver comes without these specific papers, yet has one of these conditions, the exam will not be able to be passed until the appropriate items are brought in. What Does the DOT Physical Exam Detect? These are just some of the issues that get looked at within the exam. 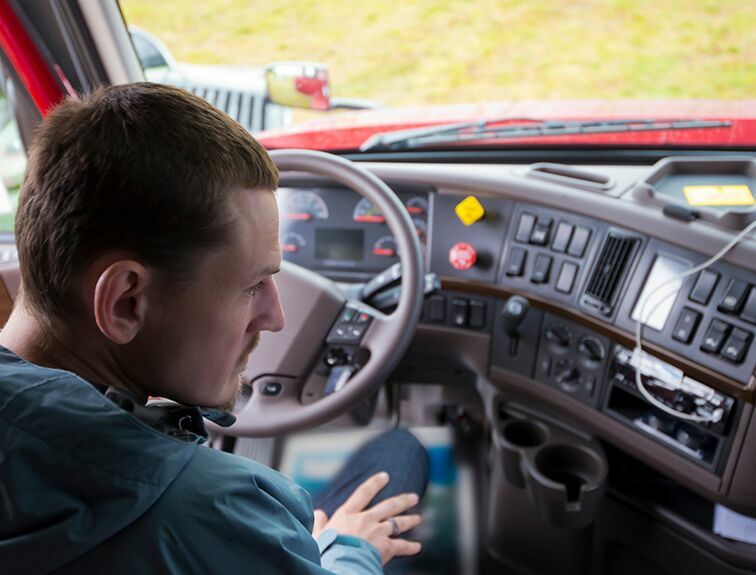 The idea behind the DOT Physical Exam is to give prospective drivers a comprehensive physical to ensure that the driver is fit and healthy before beginning their driving career. What Happens If A Candidate Doesn’t Pass? Candidates will also fail if they do not pass the alcohol or drug test that accompanies the rest of their physical. If a candidate does not pass the physical due to a medical condition, they can look into receiving a waiver. Otherwise, if the candidate fails due to alcohol abuse issues, they will not be allowed to return to work until they see a see an Alcohol Abuse Specialist and meet all job requirements. Use of drugs such as amphetamines, narcotics, or other drug-forming habits can also be grounds for someone to fail the exam, even if they are using these substances under the guidance of a doctor. For further information about passing the DOT Physical Exam, feel free to contact us at CDS Tractor Trailer Training for assistance. CDS provides Class A CDL training at four Virginia locations. Let’s get you on the road to a new career! Posted in Trucking NewsLeave a Comment on What is the DOT Physical Exam? Congratulations! You’ve gotten your first truck driving job. You have a nice shiny new truck… but now what? 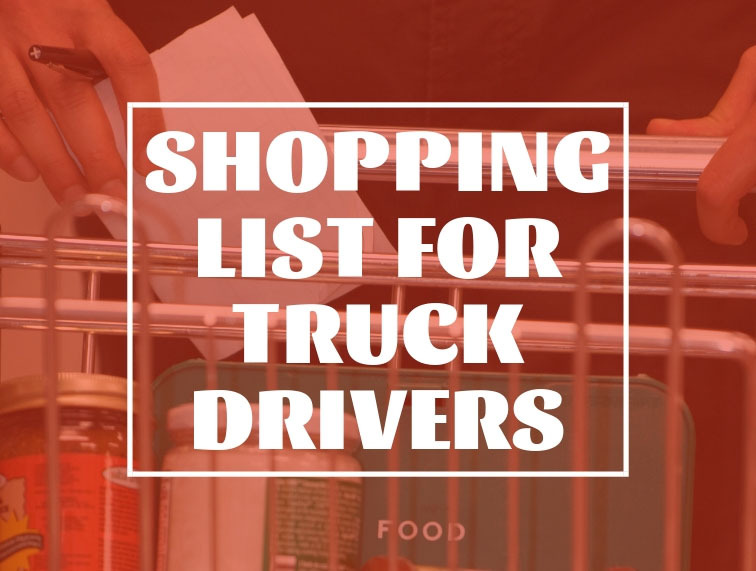 Here is a list of must-haves every trucker should bring along for a smooth ride. From comfortable driving clothes to off duty clothes, it’s important to bring along plenty of options. You’ll also want to keep in mind that the temperature may rise or drop depending on your destination, so pack a jacket as well as a t-shirt to be ready. Having plenty of underwear can’t hurt either. Make sure to bring along a raincoat and some sturdy boots for inclement weather. Also, don’t forget to bring along a pair or two of sunglasses for when things get a little bright! Since you’ll be living in your truck, you’ll want to have everything you need to get through the day. In your overnight bag, be sure to include your toothbrush, toothpaste, floss, mouthwash, deodorant, cologne, and whatever else you use each morning. If you wear glasses, be sure to pack them as well as their cleaning supplies, and contacts if you need them. Don’t forget your shower supplies like shampoo, conditioner, razors and shaving cream. Messes are bound to happen, so be prepared with some wet wipes, air freshener, paper towels, laundry detergent, and maybe even a handheld vacuum cleaner. Making sure you’re comfortable on the road is crucial, so be sure to bring whatever it is that can make your truck more homey for you. We recommend bringing blankets and pillows you also have at home. Also, some truckers bring a portable toilet so they don’t have to worry about waiting for the next rest stop. This seems like a small detail, but it will make all the difference on the road. Having envelopes to store your license and registration information will be convenient if you ever need them. Also, using manila folders for invoices, shipping information, and expense receipts can keep things organized. Things are unpredictable on the road, so be sure to bring along your toolbox in case an issue arises. Things you can include are zip ties, pliers, brake cleaner, a hammer, a pocket knife, a flashlight, a screwdriver, a wrench, and a tire pressure gauge. Maybe even bring along chains for your tires when there’s a chance of ice on the road. If an emergency presents itself, you might have to step out of your truck at night or in inclement weather. Be sure to have a reflective vest on hand, flares, and cones to make sure other drivers won’t hit you. Try and avoid stopping at fast food restaurants along the road by packing healthy snacks. Chances are, you probably won’t have a refrigerator on the road, so be sure to bring foods that can last on their own like apples, crackers, peanut butter, meat jerky, and nuts. For meals, aim for easy to make recipes like sandwiches, soup, and salads. It might get boring out on the road, so be sure to bring along some fun items you can use in your spare time. Some options we recommend are books, laptops, tablets, crossword puzzles, activity books, magazines, and newspapers. You might also have a hobby like photography, art, or knitting, so bring along materials for these to keep you occupied. Bringing these essentials will make the best of your trucking experience. We know there isn’t much room in your truck, so pack smart and bring what seems necessary for you. If you are looking for more tips for your first time, feel free to look around our website or contact us about a training program that would be right for you. Safe travels!